Chennai: As an automotive partner of the 2018 FIFA World Cup, Kia Motors India is creating an exciting opportunity for young Indian football players (between the ages group of 10-14) to experience the 2018 FIFA World Cup Russia™, as part of the Official Match Ball Carrier (OMBC) program. At each match of the 2018 FIFA World Cup, a total of 64 fortunate young people from all over the world will participate in the OMBC program, two of which will be from India. Delivering the all-important football to the pitch where soccer legends will play for the ultimate prize in the sport, these young people will play a key role in each and every pre-match ceremony. This is an important moment for Kia India and indeed the country as a whole. 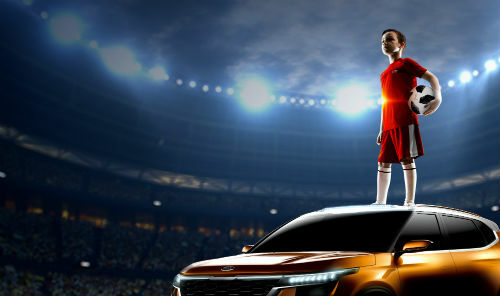 Never before has India had official representation at the FIFA World Cup and Kia, a brand synonymous with sport and ‘the power to surprise’ has brought it to the Indian people, only a short while after entering the market. The Kia OMBC campaign will be launched across India on social media and other digital platforms from 10thApril, geared towards all young football fans with aspirations of being the footballers of the future. To enter the first phase of this exclusive competition, the guardian of the entrant must record and submit a short film of them showing their passion, skill and interest for the game – all entrant videos should be uploaded to www.kia-motors.in/fifa2018 In the second phase the shortlisted entrants will be called for an on-site selection process based on their football skills, agility, attitude and teamwork. Six will be selected, Kia judges will select their best two to be the OMBC and the other four will accompany them to witness the matches. For the trip to Russia, Kia Motors will cover all travel and accommodation costs for the winner and their guardian.